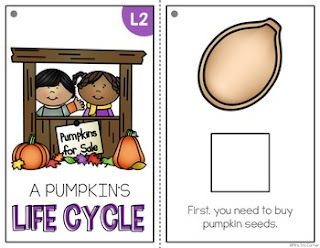 Autumn is the time of year we teach about pumpkins and the pumpkin life cycle. How do I put these adapted books together? • Print on card stock and laminate. • Cut on the dotted line on each page. • In the upper left corner of each page is a grey circle. Hole punch here and use a 1" binder ring to hold the book together. • Put a piece of Velcro in each empty box or circle. Put a piece of Velcro on the back of each answer piece. Find more Adapted Books here.